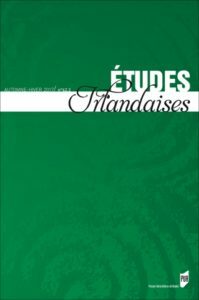 New deadline for the 2019 issue of Etudes Irlandaises is 1 October 2018. Submissions must be sent by 1 October 2018 to catherine.conan@univ-brest.fr et flore.coulouma@gmail.com. 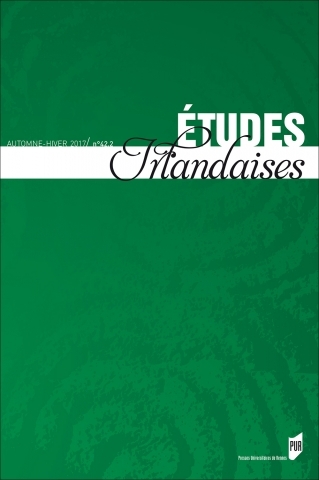 Nature, environment and environmentalism in Ireland Spring 2019 issue of Etudes Irlandaises. Identifying Ireland with nature has been a commonplace for so long that their complex relationship has become obscured and now calls for renewed examination. Essentialist tropes positing Ireland as a refuge of authenticity and wilderness in the Western world have endured from the colonizer’s naturalizing discourse to British conservationism and now strive in the Irish tourism industry. The Celtic Tiger years successfully relied on, and reflected, a dual picture of global business attractiveness and unspoiled nature, promoting the pure waters of Green Erin—together with its fiscal leniency—as the ideal setting for pharmaceutical and IT companies and a unique location for salmon fishing. Only after the fall of the Celtic Tiger did another landscape begin to emerge: that of a dilapidated, polluted environment, symbolized with striking effect by the mushrooming “ghost estates” that now scar the Irish countryside and suburban areas. Such visions of the New Ireland reflect the concrete, geographic impact of post-industrial late capitalism, thus placing Ireland onto a global map of environmental crises and largely debunking a myth that is still desperately advertised by the national tourism industry today. All consumers of the Irish landscape and its natural resources—foreign tourists and nationals alike—share an ambivalent attitude towards Irish nature, which can be traced back to the colonizing process. The colonizer went through a symbolic process of dehumanization in order to reduce natives to mere parts of the landscape—a landscape whose ownership by the colonizer was posited as a natural process of history. For the colonized Irishman, symbolic humiliation was a prelude to the confiscation of natural and agricultural resources and the alienation of cultural heritage, epitomized by the brutal overhaul of toponymy and subsequent destruction of the symbiotic link between place and language. In such a context, it is no surprise that, according to Hilary Tovey, the early ecological activism of 1970s Ireland largely considered environmental degradations in terms of damages inflicted by outsiders and denounced the globalized avatars of British capitalist imperialism rather than homegrown policies. One can indeed legitimately ask if and how Irish artistic and cultural production has become a fertile ground for critical and retrospective reflection on Ireland’s ambiguous relationship with its “nature” understood as a form of congruence between its identity and its environment. Thus the mythical status of the West, the central question of land ownership but also the puzzling under-representation of the sea given Ireland’s insular status constitute so many aspects of a national ecopsychology (Theodore Roszak) that transpire in artistic productions. Literary form is of course essential here and Seamus Heaney asked the fundamental question in this respect in “Known World”: “How does the real get into the made-up?” The idea that one of art’s functions should be to probe the link between form and material reality seems to interrogate the notion of the arbitrariness of the sign inherited from the linguistic turn in critical studies. Thus the question of the representation of the material environment also becomes that of the materiality of the work of art itself, which opens new perspectives for a neo-materialist study of Irish cultural production. This is especially perceptible in artistic performance or in the new travel diaries (see for instance Garrett Carr’s The Rule of the Land, 2017), the ultimate goal being to wonder whether beyond their mimetic function of representation, literature and poetry can make Ireland a habitable place. Articles should be submitted with an abstract and a list of key words.